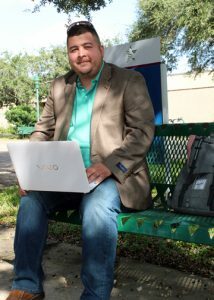 (HARLINGEN) – At a crossroads in his life, Robert Ahrens decided to enroll at Texas State Technical College, opting for an online program so he could continue supporting his family. The La Feria native is enrolled in Business Management Technology, one of four programs with degrees that are offered entirely online. The other TSTC programs with online degree tracks are Digital Media Design, Architectural Design & Engineering Graphics and Health Information Technology. These are among the many other hybrid programs available, which offer lectures and labs both on campus and online. A retired police officer of nearly a decade, and now a full-time truck driver with Spirit Truck Lines in Pharr, Ahrens said he has exceeded his own expectations. Ahrens, who expects to earn his associate degree in Summer 2020, boasts a 3.9 grade-point average, is on the dean’s list and was inducted into Phi Theta Kappa Honor Society in 2016 for his high marks. Ahrens is also a recipient of the Lozano Long Promise Opportunity Scholarship, Shell National Merit Scholarship and Texas Science, Technology, Engineering and Mathematics (T-STEM) grant. The full-time worker and full-time student said he’s only home 34 hours a week, the rest of his time is spent transporting goods across the country, finding hotspots or truck stops with internet. He also said even his laptop has seen better days, but he’s not letting anything stop him. TSTC Campus Lead for Business Management Technology Edna Claus said Ahrens has done exceptionally well despite the fact he is on the road most of the time and cannot depend on constant or reliable access to his courses. “Robert has done well. His persistence is one that can be modeled by all of our students,” she said. Ahrens is registered and ready to begin his Spring 2019 semester. “TSTC has made me a well-rounded student and I know whether I stay at Spirit or end up somewhere else I will find success,” he said. For more information about online programs at TSTC, visit tstc.edu/tstconline. This entry was posted in Harlingen on December 10, 2018 by Amanda Sotelo Sotelo.